How many times have you bought new lipstick, only to find the color is less than flattering on you? Or maybe you accidentally purchased the wrong shade of blush, making it look like you stepped right out of a bad '80s movie. We've all been there. Makeup can be quite expensive, and you'd hate to purchase something that doesn't work for you. 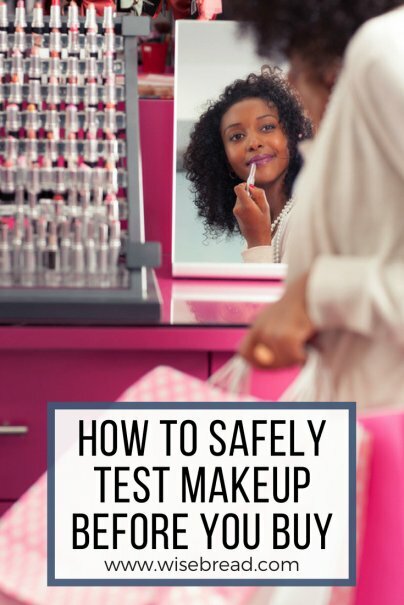 Testing makeup before you buy can solve many of your beauty woes, but it can lead to a slew of other problems. When everyone uses the same samples, it becomes a breeding ground for bacteria and other icky germs, which can lead to rashes, breakouts, or even worse: infections. The first order of business is to ensure the tester is freshly prepped. You can do this by asking a sales associate for assistance. This step is integral because most samples contain some level of contamination. In fact, in a 2004 study conducted by Rowan University, researchers found that after testing makeup samples taken from different companies over the span of two years, 67 to 100 percent of makeup samples contained bacteria. Yuck! To ensure that you're getting a safe and prepped tester, watch the sales associate as they prep the sample. Every type of makeup is prepped slightly differently. For lipsticks, the salesperson should scrape off the top layer of product, then spray or dip it in alcohol, and wipe it off with a tissue. To apply, use a fresh, disposable applicator or brush provided by the salesperson. Don't use your finger or unsanitary brushes to apply a lipstick sample, as you will just contaminate the product further. Even with a prepped tester, you should proceed with caution. With many beauty products, contamination can run deeper than just the surface layer, and it's just not worth the risk. Avoid putting any product directly on your eyes or lips since that is where you are most susceptible to contracting diseases. Instead of testing a product on your eyes or lips, try it out on your wrist or the back of your hand. You'll get an idea of what the product will look like on your face while sidestepping the risk. While testing out products before you buy is certainly helpful, there are some products you should avoid testing altogether. Mascara is nearly impossible to prep safely. Bacteria can stick to the wand fibers, making it dangerous to put near your eyes. You can ask for a tester wand, but that doesn't mean someone before you didn't double dip. Plus, if you use a tester wand, you won't have the opportunity to test the wand that belongs to the mascara, which is part of the product. Eyeliner, although generally safe if you sharpen it, can also be dangerous to put near your eyes. Instead of testing out eyeliner on your eyes, try drawing with it on your hand or wrist. This will give you an idea of how the product may look. Any powder makeup, or makeup in pots or small jars should be avoided entirely. Any bit of contamination can affect the whole product by going beneath the surface layer or sticking to the edges of the container, so it's risky even if it's properly prepped. While not every store does this, many are happy to provide you a fresh sample upon request. From my experience, stores like Ulta and Sephora keep small samples on hand in the event that customers want a clean test product. Of course, out of courtesy for the store, try to limit the number of fresh samples you are requesting to one or two. Instead of using potentially germy samples in the store, have fresh samples delivered to your door. Many cosmetic stores, like MAC and Sephora, allow you to choose free samples with every online purchase. These mini-makeup products are packaged for individual use, so you can trust that they have not been touched by anyone else.